People who live in desert areas can’t seem to get a break – they have to worry about extreme heat, dehydration, and… camel spiders! 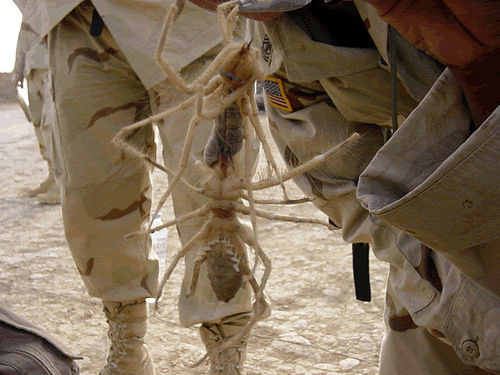 Whether it is a civilian or a solder deployed for combat, they will all have to be wary of pesky camel spiders. These desert-dwelling spiders are agile, large, and extremely aggressive. They have been known to “hunt” people down for hundreds of yards. Below I will detail how you can repel and avoid a pesky camel spider. Camel spiders will not be attracted to you, but if there happens to be delicious prey nearby, it will not hesitate to approach you. As such, if you want them to leave you alone, you need to first clean the area of small bugs like the darkling beetle. The camel spider is a voracious eater of bugs and termites, and if you are dwelling in a tent or building with an abundance of them, expect the camel spider to pay you a visit. If there are bugs or insects that happen to crawl on you, you may receive an indirect bite from the camel spider. Fortunately, a bite from the camel spider, though painful, is not poisonous. Their powerful pincers can easily penetrate skin and draw blood. You should not take their bites lightly, as they can still cause infection if left untreated. Don’t leave your food out in the open! Even though camel spiders won’t eat human food, the food may attract insects that do. And guess who eats the insects that might want to eat your food? That’s right, the camel spider. Keep your food in protective containers, like a metal box. That way, you can keep it protected from bugs and other nasty critters, and indirectly keep the camel spider away. A bit unusual sounding, but your shadow can attract the camel spider. After all, shade is shade, and the camel spider doesn’t differentiate whether it is in shade behind a rock or a human. Yes, even camel spiders need shade too. They prefer to not go out during the day, and will spend a lot of its time hiding in the shade. Many people misinterpret the camel spider’s action as an act of aggression and attack it, causing it to actually be mad when in fact it just wanted to rest in the shade. They can travel at a top speed of 10 mph, which is about 1/3 of the speed a sprinter can reach. Therefore, if you provoke a camel spider, either be capable of killing it, or you will be in for a long game of cat and mouse. So, if you are traveling along the desert and notice the presence of camel spiders, do not open up an umbrella or create large shadows near them, or else you might invite them to come running. It is not a good idea to use an insect spray on a camel spider. They are resilient and will not die from it; you would simply anger it. Camel spiders cannot be domesticated; they are untrainable and only prefer to dwell in desert environments. Check any areas that might have dark spots, e.g. sleeping bags, shoes, backpacks, etc. They provide a source of shade, and it makes an ideal spot for camel spiders to take shelter in it. Keep your sleeping bag and other gear zipped up during the day. For more articles, use the navigation menu at the top to see individual categories, or click here to read about how to spot a spider infestation and here to learn how to repel spiders in general.